META Lab seeks to build an online math and data boot camp, as a low-cost way to help students meet the minimum requirements of the science, economics, and tech courses required in their graduate degree programs at MIIS. This project is led by Melissa Hanham, Phil Murphy, and Fernando DePaolis of the META Lab at the Institute. 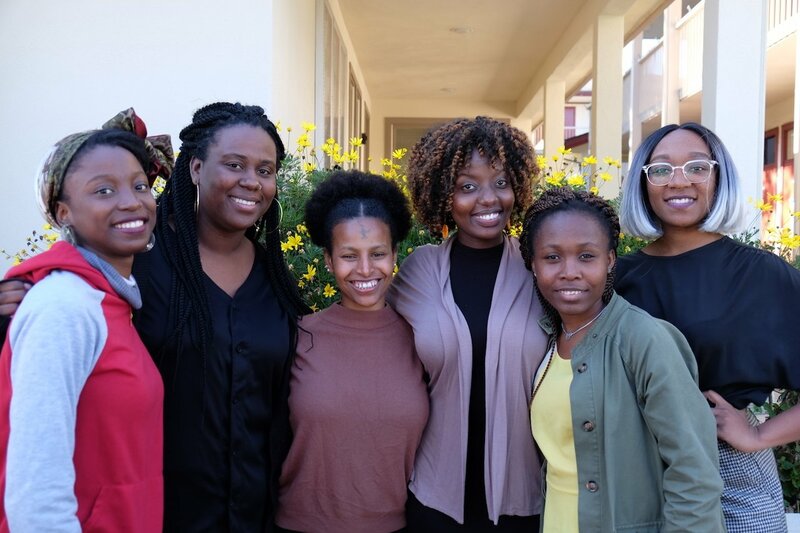 Led by MIIS student Tangut Degfay and Professor Andrea Olsen, this project - involving ten artists with ten cultural views - creates a series of arts events integrated with curricular offerings for spring 2018 at MIIS. 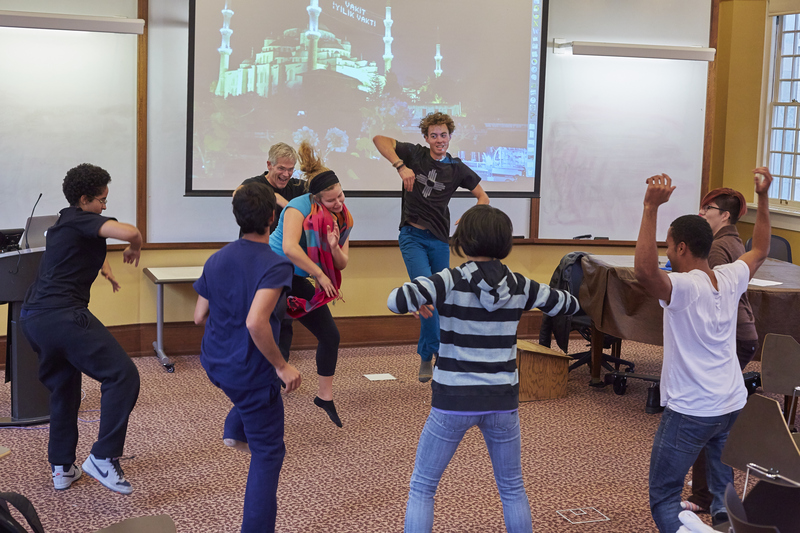 Innovative inclusion of scholarly and participatory arts in various disciplines and courses at MIIS links academics with specific student clubs, past FFI initiatives, and virtual innovations in the DLC. Want to learn more about 10 x 10 @ MIIS? Check out their website! Political Science Professor Sarah Stroup will host a series of deliberation cafes in the Fall 2017 and Spring 2018 semesters. This initiative will involve dettailed deliberation and perhaps heated discussion, but unlike most debate formats, there is no "winner" at the end of these conversations. Rogers Walker, Associate Director of Intensive English Programs at MIIS, will create an online service learning program that will facilitate collaboration between English language learners in Monterey and Japan. Students in Japan will participate in live sessions with English teachers at MIIS, and these Japanese students will collaborate on service projects with English students at MIIS and with community partners in Monterey. Danilo Herrera Fonseca, Devin McGrath-Conwell, Briana Garrert, Maxwell Leslie, and Iram Asghar will write, produce, and publish a 10-episode web series that promotes social and cultural acceptance. They will take advantage of the political, viral, and entertaining aspects of new media to tackle current and relevant issues on campus and across the nation, while also connecting viewers to insightful and helpful resources that are already available. ThinkingBuddies is a study group facilitation initiative that is searching for students to help carry out its mission of changing Middlebury College's academic and social culture. Project lead James Moser ('16.5) is working various classes throughout January 2017. To learn more about ThinkingBuddies, click here! Piloting the project with a TESOL curriculum design course, Bob Cole will explore how Virtual Reality might affect language learning at the Institute and across Middlebury. The VR equipment will be available for other Institute projects, including being incorporated into other FFI projects. Peggy Burns, The Director of the Center for Careers and Internships, Alicia Gomez, The Asst. Dir. Career Advising, and the Film & Media Cultures department at Middlebury College are taking 10 College undergraduates on an incredible learning experience to Los Angeles in February 2017! Bringing together staff, faculty, current students, and alumni, this trek is intended to connect Film & Media students with professionals in the field. Students will spend a week shadowing and working for prominent alumni in LA, the days spent in an internship-like format and the evenings spent networking and debriefing on their learning experiences. Due to the high success of the LA Trek, CCI will be offering a second trek in spring 2018. This trek will be focused on the tech industry and will take students to the tech mecca of the nation: Silicon Valley. Led by Professor Ioana Uricaru, this workshop and mentorship program aims to support the next generation of screenwriting talent at Middlebury. Taking place during Winter Term 2018 at Middlebury's historic Bread Loaf campus, this workshop will offer Middlebury screenwriters who are beginning their careers a place to focus intensely on their craft and Middlebury students the unique opportunity to interface with the world of professional screenwriting. Interested in the Script Lab? Check out their website here and read the Newroom's article on Script Lab here. Shawna Shapiro, Assistant Professor of Writing and Linguistics at the College and Netta Avineri, Assistant Professor of TESOL/TFL at MIIS, have teamed up to work with communities who have arrived in Vermont through the process of refugee resettlement. The goal of heritage language programs is to foster students’ linguistic proficiency and literacy in the languages spoken in their homes and communities, which in turn facilitate students’ explorations of their cultural histories, identities, and experiences. While their FFI funding ended in 2016, Professors Shapiro and Avineri are excited their project will continue in 2018 after receiving funding from the Center for Community Engagement, the Vermont Humanities Council, and the Refugee Outreach Club. Team Tandem is an innovative language learning experience that connects Spanish learners at the Middlebury Institute of International Studies with English learners in the local community. Through the use of a "Language Bus," two neighboring groups of language learners will be brought together in a tandem format of reciprocal exchange where all participants are both students of their target language and teachers of their native language. This initiative is led by April Danyluk '16, IEM/MPA, and Professor Gabriel Guillen of Spanish Language Studies at GSTILE, both at MIIS. The course developed from this project, Spanish in the Community, has been absorbed into the curriculum and has been offered four times at the Institute. The project was presented at key applied linguistics conferences such as Computer Assisted Language Instruction Consortium Conference and will be presented at Center for Educational Resources in Culture, Language, and Literacy Conference and the American Association of Applied Linguistics Conference. Professor Kazumi Hatasa, Director of the School of Japanese, is developing Japanese language learning activities, guided and discovery tours of local communities in Japan during study abroad, and dynamic guides of campus and town for Japanese School summer students, all through the use of the ARIS (augmented reality and interactive stories) platform. All the developed activities will be available for use on smartphones and tablets. Director Kerstin Wilsch and Assistant Director Hope Fitzgerald of the School in Jordan and Professor Lama Nassif of Middlebury's Arabic Department are further improving the teaching and learning of spoken Arabic at both the College and the School in Jordan. The project consists of the joint development of spoken Arabic through faculty exchange visits with pedagogy workshops and presentations on both campuses. Through the active sharing of teaching methods, curricular materials, and learning goals, the overall sense of cohesion and cooperation will be developed between the two campuses in a manner that will enhance Arabic students' linguistic learning experience. 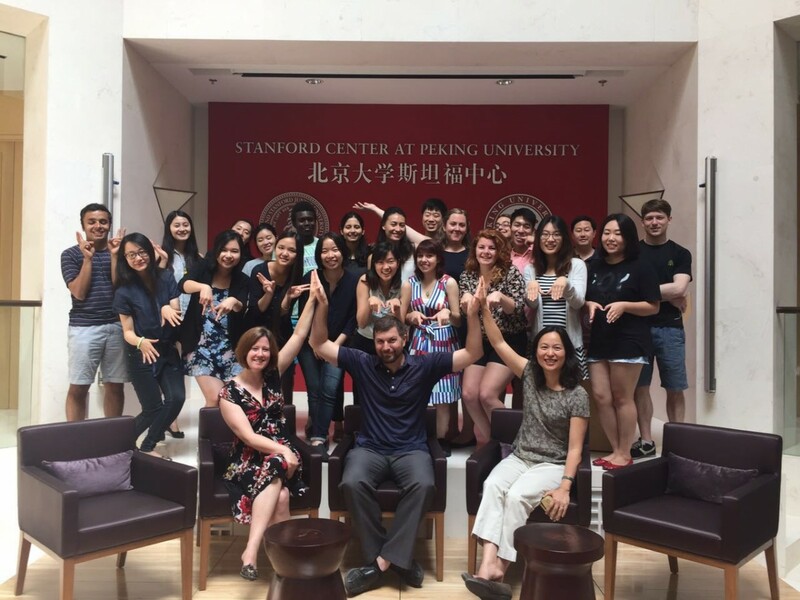 Political science Professors Jessica Teets and Orion Lewis from the College and Professor Wei Liang from MIIS are leading a multisemester project with students from both schools. In this project, students will build out their substantive understanding of China through coursework, be trained in research methods and research design, and will leverage their language and analytical skills to conduct original research in the country. To explore their work and adventures from the summer, check out the team's dispatched on their website! Professors Teets and Lewis received a National Endowment for the Humanities grant to replicate their project in the Dominican Republic in 2018. Professors James Berg and Marion Wells, along with Special Collections and Archives Director Rebekah Irwin, piloted a Paleography, Book, and Manuscript Seminar at Middlebury's Center for Medieval and Renaissance Studies (CMRS) Oxford Humanities Program. In this seminar, they will explore the physical traces of past reading, and gain practical expertise in the observation, description, and deciphering of ancient texts that have become more widely available due to advances in digital scholarship and platforms. Professors Scotty Hardwig and Christal Brown of the Middlebury College Dance Department are creating a fully-functioning motion capture lab to provide a space for kinetic learning and creative applications across the disciplines of dance, film, music, computer programming, and animation. The hardware and software can be used to produce high-end avatarial animation, live-capture digital animation, and any number of cutting edge technological interfaces between technology and the body. It will also be a resource for personal trainers and sports medicine staff to conduct athletic research with student athletes. German Professor Florence Feiereisen and Mathematics Professor Frank Swenton created a student-driven collaborative research program during Summer 2016 in the field of computational linguistics. Students deepened their existing background in linguistics and extended that knowledge into the information age via a project in computational linguistics. Led by Assistant Dean Patricia Szasz of GSTILE at MIIS, this project is converting the J-term portion of the Spanish Community Interpreting Graduate Certificate program into online coursework. This will make the certificate program more accessible, requiring potential students to be at MIIS for only one in-person stay during the summer instead of multiple times throughout the year. All other work for the certificate can be completed by students online. To learn more about the Spanish Community Interpreting Graduate Certificate Program, watch this video. Sprintensive is a re-designed spring semester experience at the Middlebury Institute of International Studies at Monterey (MIIS). Sprintensive divides the spring semester into four blocks, allowing students to take four intensive courses sequentially. Associate Provost Amy McGill and DPP Professor Beryl Levinger have received funding for a pilot of Sprintensive where they will test the feasibility of such a program. 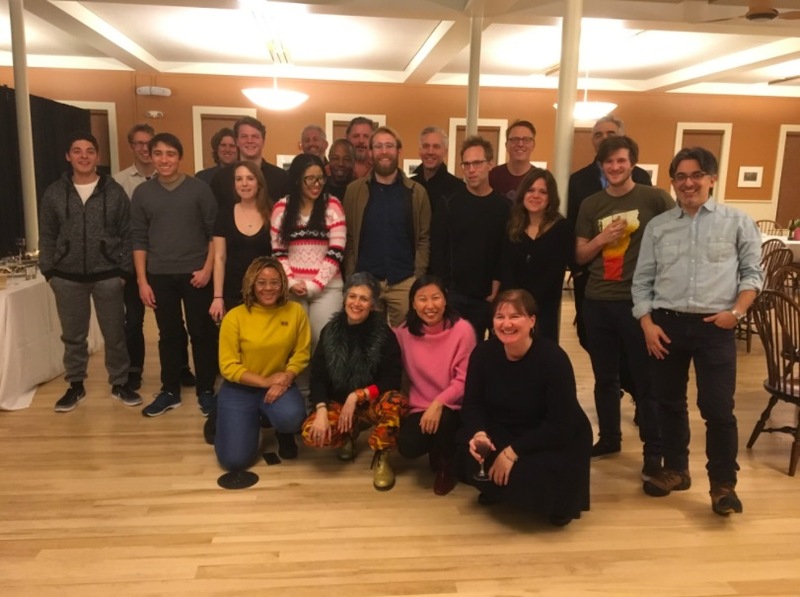 Now in its third year, Sprintensive continues to offer sequential intensive courses in the spring semester to a cohort of approximately thirty students. Development Practice & Policy faculty continue to join the experiment, with two new MIIS faculty members teaching their first Sprintensive modules in Spring 2018. We are also excited to welcome Middlebury College psychology professor Michelle McCauley, who joins Andrea Olsen in offering a Sprintensive course. In her new role as Curricular Innovation Officer, Prof. Levinger has also cultivated a group of College faculty who are interested in the possibility of “Middtensive” experiments on the Vermont campus. Interested in learning more? Visit here! 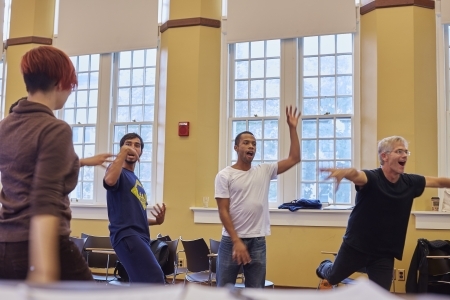 Led by Middlebury College Theatre Professor Dana Yeaton, Oratory Now is a student-centered initiative to reinvent the way oral expression is taught, practiced, and recognized at Middlebury. Taking place both inside and outside the classroom, the multifaceted program consists of experienced peer tutors who help students develop their public-speaking skills—ultimately helping to shape a college-wide oratory program. To learn more about the initiative's student organization, the Oratory Now, visit their site here. Using the Inside-Out model of learning that has launched successful prison education programs at peer institutions such as Wesleyan, Bard, and Grinnell, Sociology Professors Rebecca Tiger and Linus Owens have planned a similar program for Middlebury, in which Middlebury faculty will teach courses at a Vermont correctional facility and Middlebury students will learn alongside inmates. Check out these spring 2018 articles on Professor Tiger's work: featured on the Middlebury Newsroom and the Campus.